If you are interested in providing products or services to TSMC, you are required to register for a supplier account and provide accurate business information for business initiative. You are liable for the information you provide to tsmc, and you warrant that the information you provide is true and accurate. The more detail information you disclose, the better tsmc can evaluate you as a potential supplier. Please note that passing the tsmc supplier qualification procedure is a pre-requisite for starting business transaction (i.e. receiving purchase orders) with tsmc, and that by registering for an account and providing information do not automatically qualify you as a tsmc supplier. To ensure the proper division of labor and to avoid unnecessary conflict and dispute of commercial interests, Procurement personnel shall be the principal window for business interaction with vendors. All of supplier’s visit for business negotiation and technical communications will be governed by “Rule for Managing Interaction between TSMC and Sales Personnel”. Unless you have become a qualified supplier of tsmc, you cannot register for meeting. Knowing the above will facilitate your application more easily and smoothly. It takes 3 to 5 working days to create a supplier’s temporary account. You’ll receive an email to confirm your application and Portal portal account password. Please change password as soon as possible to enable the supplier temp account. Complete all mandatory data field and submit for tsmc buyer review. Please understand that your account may be expired if there is no activities for more than 1 year. To ensure your company will be found from the registered supplier pool, please fill in the required information truthfully and accurately. TSMC has the right to terminate the business if the information provided is inaccurate or false. You will not receive any inquiries until TSMC initiates its internal business qualification process. Please complete sanity check for supplier profiles, especially for “banking information” and save the data if you can not finish the manadatory data all at once. Download tsmc standard contracts first and upload documents after sign off. TSMC has developed different standards and criteria for certain business categories. Following business qualification, suppliers will be required to provide corresponding data and documents for technical evaluation. To comply with the rules for “Managing Business Interaction with Vendor”, the interaction between tsmc and suppliers shall be managed properly including the business negotiation and technical communication. Therefore, tsmc designs a system to support suppliers to register visiting request and allow tsmc user to be able to manage and control the supplier visiting including the meeting in tsmc, out-side tsmc and conference meeting. If you are a qualified supplier of tsmc and require a meeting with tsmc users or/and buyers, you can apply meeting registration. System will have an internal approval process. Once receiving approval notice, you can notify your booking number to tsmc receptionists for check-in if your meeting location is in tsmc. 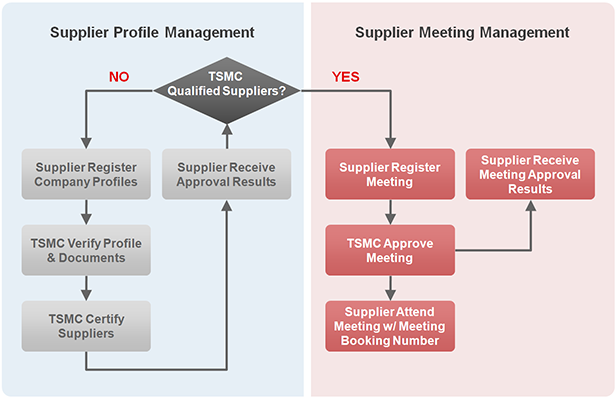 If you are a new supplier to TSMC, please register for supplier account first. Copyright© Taiwan Semiconductor Manufacturing Company Limited 2013, All Rights Reserved.